Genos is a 19-year-old cyborg and disciple of Saitama. He is always aiming to become stronger and fights for justice. As a registered Superhero, he is in the S-Class ranking at 14. 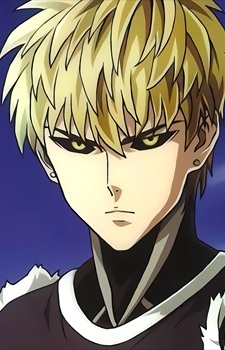 Genos has a mechanical body of a teenage young man, a pale looking face, blond eyebrows, black sclera and yellow piercing eyes and has blond spiky hair. Over his mechanical limbs, he wears black pants and black shoes. Genos sometimes sports new black mechanical arms, during the time when he sparred with Saitama, and during the time on preparing to stop a giant meteor, he equipped more block-shaped, black mechanical arms along with a small headgear. Genos is an extremely serious character. He has a strong drive to get stronger than he is, and pesters Saitama to train him frequently.